Physics Department, TUM | Why PH @ TUM? HomeAcademicsWhy study Physics?Why PH @ TUM? The Physics Department of TUM is not only one of the biggest and most prominent research centers for physics in Europe but also the academical home for more than 1000 students, 200 doctoral candidates and 300 scientists. Campus Garching during summer. Photo: TUM. From the smallest particles to the structure of the universe, from the characterization of semiconductor quantum structures to the scientific investigation of biological systems, novel materials and medical applications: Already during your bachelor program at TUM you become familiar with the complete spectrum of modern physics and interdisciplinary research. During your subsequent master program you then have the possibility to deal with special physics topics chosen individually from a catalogue of more than 100 courses and to control your scientific development targeted. With the research reactor Munich (FRM) as starting point in 1956 the TUM opened its third location at Garching and inaugurated 1969 also the physics department there. Since that time the physics department can look back on a long-standing success story. The resulting reputation as well as the existing international network of researchers and lecturers have a substantial part in the fact that the TUM can call oneself elite university nowadays. 2013 the TUM defended its top position at the international Shanghai Ranking (ARWU) beyond the German universities. The physics department is one of the biggest physics faculties in Germany with many internationally accepted and distinguished scientists. Experts with worldwide respect there are working in the fields of astroparticle and nuclear physics, nanotechnology, biophysics, condensed matter physics, spectroscopy with neutrons, novel materials, cosmology and many more. Furthermore many members of our faculty play a leadership role in big research projects, especially in various clusters of excellence and special research fields. The Nobel laureates Rudolf L. Mößbauer, Klaus von Klitzing, Johann Deisenhofer, Wolfgang Paul, Erwin Neher and Wolfgang Ketterle did research at the physics department of TUM. Everyone looking for a direct link to research and practice is in good hands at the physics department of TUM. High-ranking scientists in combination with outstanding research conditions guarantee a first-class education. 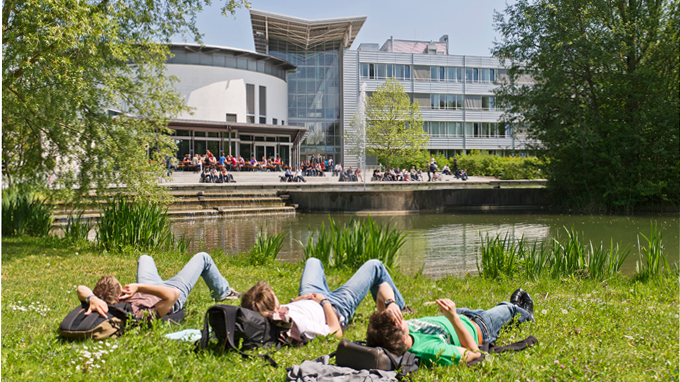 In addition our physics programs take place on one of the biggest research campuses in Europe: the campus Garching. In striking distance there is the most efficient research neutron source in Germany, the fastest supercomputer in Europe at the Leibniz computing center, the tandem accelerator at the Maier-Leibnitz-Laboratory, a couple of Max-Planck-Institutes and many more research institutes. During our programs we take care about small work and study groups and therefore provide a good and very individual mentoring. Besides the normal exercise courses we offer also holiday courses and beginner's courses. A special mentoring system between professors and students stimulates a lively communication, qualified tutors guarantee good learning conditions, especially at the beginning of the physics program. The campus Garching shows international ambience due to many scientists and students from all over the world. Various international exchange programs concerning study programs, lab courses or research projects, English master programs and fellow programs contribute to the excellent international reputation of the TUM. Besides close contacts to partner universities there exist double-degree-programs with other first class universities in many different countries which also promotes the internationalization of the TUM. We offer access to modern computer systems: from free laptop lending for writing your thesis, numerous workplaces in several computer pools and area-wide WLAN, to the most powerful computer in Europe at the Leibniz computing center. In addition our students have the possibility to work with useful software packages without charge. Lectures, exercise courses, seminars, lab courses,talks, research laboratories and institutes, academic libraries, computer pools, rooms for students and cafeteria, all locations and events can be reached by foot within a short time on the campus Garching. Greater Munich is the unchallenged front-runner as research and technology location in Germany. This guarantees our physics graduates a superior outlook at the local job market and offers many possibilities doing practical trainings at research institutes or industry. The TUM is situated at one of the most beautiful cities of Europe: at Munich, the cosmopolitan city with heart. With its unique mix of arts, culture, science and sports Munich offers not only a high quality of life but also international ambience. In addition the TUM is an university with exciting activities and events: a variety of festivals, several academical orchestras and choruses, the TUM cinema and many possibilities to go in for sports guarantee welcome activities besides your physics program. And last but not least the landscape near Munich, especially the Alps and numerous swimming lakes, invites to manifold leisure time activities. What is it about studying physics?